Where I can find Googles official post about this new algorithm ? Does Google Panda update now live? Google said its now live for all English Language Google users. I’m a webmaster and how this affects me? Again if you are Content Farmer ( If you do Copy=>Paste most of the time ) beware your site may soon loss traffic like hell. Caffeine went live or SERP increase? Yes this is interesting step taken by Google. But what about the news site and software site that has same content all over places? will it have impact on them as well? Yes, I have same question like this. Could anyone answer me? Thanks for the information and the link. I have been away for a while and just learned of PANDA. I am not a content farmer so hopefully I will not have to worry. it is very useful information . i m not a content farmer , so for me no tension . Panda. I am tanda, come to me lolzz..
Oh my God … Scary!! that will be good i think . It won’t turn out to be a nightmare for the original bloggers. Well, its an alert for all article writing services websites like ezine, etc. Google Panda has stuck them badly due to user generated affiliate links. hey ruchira.. thanks for such nice and content build information..
Well? If you do your SEO the right way, with unique content every time, Panda shouldn’t course any troubles…Or what do you guys think? personally im not doing SEO at all these days! Unique content is the key! It will drive you backlinks ! I am a developer and seo worker . I thinks due to this the importance of white hat seo has increassed. hope this doesnt affect me. Google Panda – brilliant news!!! As someone who has spent many long hours researching and writing fresh content for the web it’s a blessed relief to at last find an antedote to the longstanding issue of copyright infringement. Most webmasters who create unique content will just love it and embrace it since now they get rewarded for the work they created. It’s just super frustrated to see content stealers even above you in the serps being your competitor knowing they didnt do any effort to get there. Google Panda is a good update for smart workers. This is nice information. I got it very useufl. However, can you say how do I know that my site is affected by Google Panda? Check the traffic in Google Analytics. You will see a great fall in traffic (upto 50-80%) and you would come to know if your website has been hit by panda or not. It sounds like a good thing to me. Hopefully people will write more original content now. Well, now panda makes the move for blogs and websites. 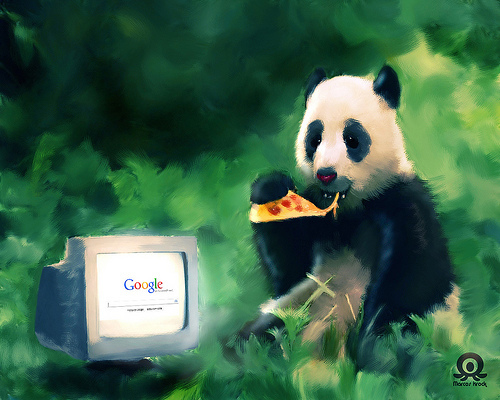 Every webmaster just prays for survival from Google Panda (yes, even the non-copiers). Good Post, appreciate the insight. very useful information. This is my first time, where I get some information about Google Panda. Good information about google panda.. Thanks for this inforrmation, I was confused about Panda. Good but not explained who it works and what are its effects…………….. I guess i am a little behind the curve. Having opened my site after this came out how effective has this been? I still see people stealing content. That’s a very brief yet understandable description about Google panda. The official panda announcement was also posted in the Google blog besides Google webmasters central blog. Thanks Ruchira for such a great write up. Yes, my site badly got affected by it and about 70% of my traffic is now gone. Although, I just want a simple information whether copied images are included under the Panda attack or not. I bet it! since google image search is now available. there might be a chance! i have a website of sms’s and there are a lot of sms websites on the internet and many sms are about same….a big thing to worry for me…..
Google panda is very helpful for original writers and it is evil for contents spammer or robber. Does this affect Online Stores that carry the same products as others with the same factory descriptions? Just Curious, do we have to re-create our own product descriptions for products we may have never used just to stay within Panda Guide lines? Thanks for your post.Can i use article spin. Thanks for the lots of effort you made here. It will must hit some where to spammers. I think that every blogger knows the importance of fresh content and also know about the Google Action regarding the same. Your post must update blogger’s mind to aware about the Google Panda.. Thanks I learned a lot from this post.. Yes, thank you , now I understand when a person told me panda cut lead production in half . thank you Ruchira for this valuable information. It’s welcomed news for those of us who spend hours on end trying to write something original and worth reading ourselves. A new update !! This may be just what actual web developing should be about, Domain parking and copy and paste content may come to an abrupt end. i read it amazing sharing here thanx. For the average small business, none of these updates make any difference, the majority of interactions we have at our shop we are constantly told that everything social media check in too Facebook is a waster. While I disagree, I do have to admit, Panda updates are the last thing I’m worried about.